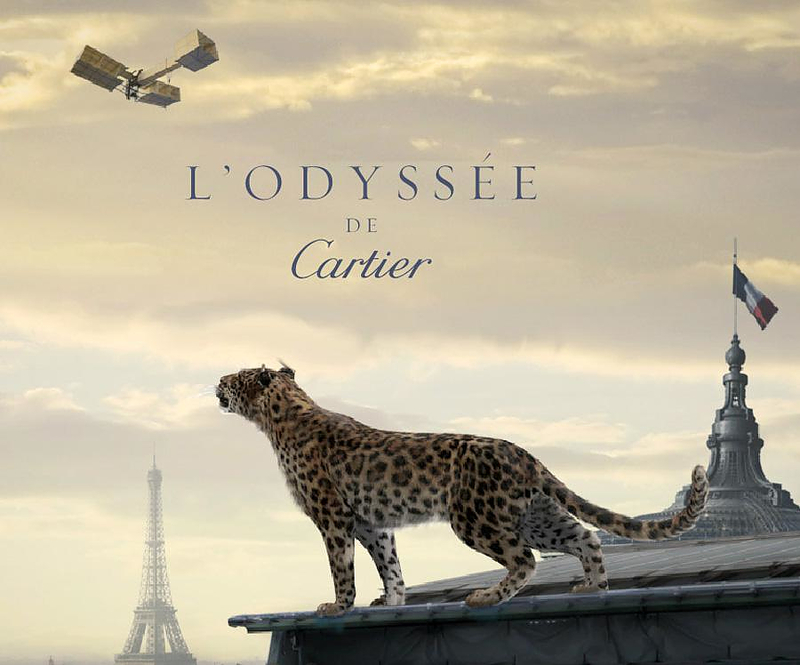 HomeBlogArtL’Odyssée de Cartier, an Epic Film by Cartier. In order to celebrate its 165th birthday, the famous French jewelry house Cartier has launched “L’Odyssée de Cartier”, a 3:31 minutes long beautifully shot and very artistic short film. The protagonist of this film is the Cartier Panther, the iconic symbol of the brand. It all starts at Cartier’s flagship Rue de la Paix storefront, where a bejeweled panther statuette magically comes to life, before embarking on a journey around the world. The film is focusing on Cartier’s history, its values and inspiration, under a very artistic scope. While the panther is running around the globe, from Russia to China, India and eventually back to Paris, he encounters key moments and locations from Cartier’s history…. The Panther travels first to St Petersburg, where he runs past a Russian tsarina flashing a Cartier diamond and from there to China where he comes face-to-face with a golden dragon, then he visits an Indian palace built upon an elephant’s back, before leaping aboard the wings of an aircraft, that is a replica of the airplane built by Alberto Santos-Dumont, to showcase the classic Cartier Santos watch. The panther finally lands in Paris, where he meets supermodel Shalom Harlow at the Grand Palais. L’Odyssée de Cartier was shot by director Bruno Aveillan via Quad Productions Paris. The Cartier panther is not CGI, it was incarnated by actual trained animals (three were used during the filming). Despite the fact that is a short film its was shot over 4 month long period, filming started in June 2011 and was completed in September. The combination of the action scenes with the real panthers and some awesome CGI graphics (such as the golden dragon) is really impressive and the whole feeling and atmosphere of the film is visually compelling. Another interesting fact is that while the film appears to show places in Russia, China and India all the filming took place in Europe. The actual locations where it was shot are France, Czech Republic, Italy and Spain. A gorgeously shot film full of carefully thought details, that brings Cartier’s long and luxurious heritage to life. There are no photos with those IDs or post 20869 does not have any attached images!